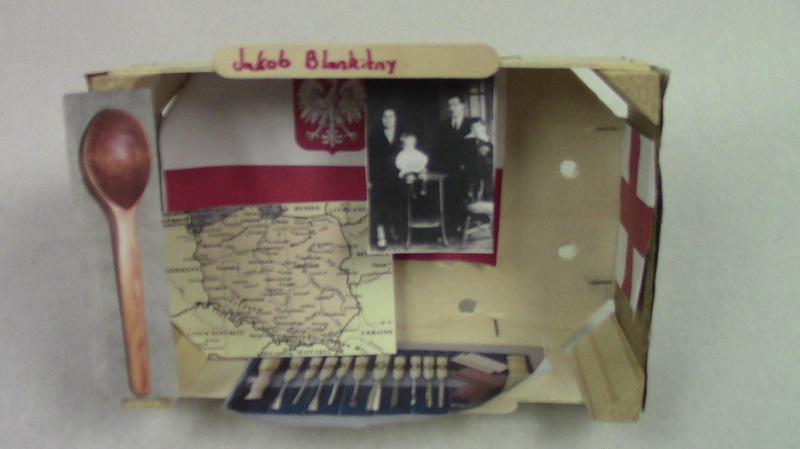 This shadow box represents the life of Jakob Blankitny a Holocaust survivor. In the photo Jakob Blankitny is the one who is sitting on the stool, and is the youngest one. The map and the flag are of Poland, where he grew up before the Holocaust happened. He lived in Makow Mazowiecki, Poland before he was sent to Auschwitz. The wood carving kit on the bottom symbolizes that he was a wood carver, and he worked as a woodcarver in the concentration camps. The wooden spoon is one of the items he kept with him in the Holocaust. He made wooden spoons in a camp and kept one with him. The red cross symbolizes the fact that he was beaten half to death and was sent to the hospital. He survived in the hospital and was healthy enough to live through Dr. Mengele’s inspection. Jakob Blankitny was sent to a ghetto in Makow Mazowiecki at the age of 16, and later sent away from his home town. He then was sent to Auschwitz two weeks after living in the ghetto. In the ghetto he somehow avoided the struggle of dysentery, but contracted typhus when living there. He survived typhus, but was sent to Auschwitz immediately after he recovered. When Jakob arrived at Auschwitz, his family was split up. His mother and his sister were sent straight to the gas chambers. Jakob was glad that he was at least with his father because, his family was very important to him. They were together the whole time Jakob was in Auschwitz. Jakob Blankitny was born on February 14, 1925. He grew up living in Maków Mazowiecki, Poland. He was the only male child in his family growing up, with one other sister. He was sent out of his town after the invasion of Poland, in 1939. When all Jews were required to live in the ghettos, he moved to the Mlawa ghetto. The ghettos were filled with dysentery and typhus. Jakob contracted typhus, and was sick for several days. Jakob was lucky to survive, but also unlucky as he was sent to Auschwitz. When they arrived at Auschwitz the women and men were separated. His father and he were sent to the left, but the other part of his family was sent to the right, to the gas chambers. Out of the 6,000 people that arrived with Jakob, only 200 of them were sent to the work camp at Auschwitz. Immediately as Jakob entered the camp, he was given a number that would be his new “name.” He was put into a barrack with his father on a single bed with four other people. A day at Auschwitz lasted from 5 am when they would get their coffee and bread, to 7 pm when they would get their soup. Jakob’s first job in a concentration camps was to dig water canals. Jakob said that he would bring back the bodies of the people who died when working. Jakob was eventually split up from his father when he stated he was a carpenter. All the carpenters were sent to a different camp. Jakob was transferred to Auschwitz 1, but demoted to working on the railroad since he was not a real carpenter. His job was to lift heavy loads off of wagons and take it into the camp. One day Jakob forgot to go to roll call and instead stayed on his worksite. The Kapos called roll call and found out that Jakob was not there. When he finally returned from his escapade, he was beaten with large logs by the Kapos. He nearly died from that beating, but he survived due to the kind people at the camp who took him to the hospital. During his time there, Dr. Josef Mengele ran an inspection to see who could stay at the camp. Jakob passed and was able to stay with the psychiatric patients. Everyone who failed the inspection was sent to Birkenau, where they were gassed and sent to the crematoria. After the beating, Jakob was barely able to leave the hospital; he volunteered for a position in which required for you to know how to carve wood. He was taken to D.A.V; where there were big locksmithing and carpentry workshops. Jakob”s new job at this camp was to make wooden spoons that were going to be sent to Russian camps. They had to make the spoons out of wood because they could be used as weapons if they were metal. Jakob could not fulfil the large quota of spoons he had to make per week, so he was sent back to camp where he would be moving heavy wooden planks. A Polish man who worked in the camp gave Jakob a job working a wood saw, due to the shortage of workers. The Russians had been fighting near Auschwitz for a while, and they were finally closing in on the camp. The Alies was so close to D.A.V that they made all the Jews walk 90km to the Leslau Station. When they arrived at the station the were put in wagons and sent to Melk, where they would work in coal mines. After Melk they were moved into upper Austria, to a camp called Ebensee. There they were given one meal a day and forced to work all day. On May 5, 1945, Ebensee was liberated and Jakob was sent free. Jakob Blankitny had great strife moving throughout several concentration camps and avoiding death many times. He lost his whole family and could not resist or else he would be shot. He went through many jobs and survived the cold weather in Germany. He was able to survive to liberation and is still living now. He is a great person, and a survivor of the Holocaust who is currently alive now.